On this page you can learn or review basic medical vocabulary for health care personnel, diseases, and medical tests and treatments. Anesthesiologists administer anesthesia so patients will not feel pain during surgery. General practitioners (G.P.s) are primary care physicians who may see their patients every year for a “check-up” when healthy. They are usually the first providers of care when ill. There are many other specialties, including cardiologists (heart doctors), dermatologists (for skin diseases), oncologists (cancer doctors), and internists (like GPs except emphasizing the internal organs—heart, stomach, etc.). There are also many other types of health care professionals: nurses, EMTs (Emergency Medical Technicians who help in ambulances, etc. ), pharmacists who prepare and dispense drugs, dentists (as well as orthodontists, dental hygienists, and dental assistants) who work on teeth, medical social workers, and others. 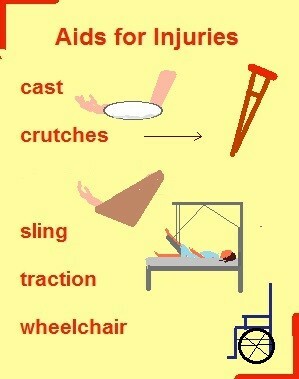 There are various words for health problems in English. When people don’t feel well, especially if we think their problem is caused by a virus or bacteria, we say they are ‘sick’ (or ‘ill,’ a little more formal.) If illnesses or sicknesses are serious or long-lasting, they are more likely to be called diseases. Injuries are damage to body parts or organs, especially cuts and wounds (breaks in the skin—cuts are minor; wounds are deeper or large), burns, broken bones or tissue tears or twisting caused by accidents or attack. Diseases have many possible causes. Some, like cancers, are the results of abnormal changes in normal body processes. Some have a genetic component, meaning that they are caused or affected by the genes a person receives from their parents. Many are caused or aggravated (made worse) by environmental or lifestyle factors like poison, smoking, air pollution, overeating, or lack of exercise. Diseases can be acute (sudden onset, short duration) or chronic (lasting years.) Diseases that are ‘endemic’ to a region occur in limited numbers but never completely disappear from the area. Epidemics are fast-spreading diseases that quickly infect a large proportion of the population and have high mortality (death) rates. Famous epidemics include the Black Death—bubonic plague—in the Middle Ages and the 1918 flu. Doctors base their diagnosis (decision about what a patient’s disease or problem is) on a combination of symptoms, observations, and tests. Misdiagnoses can lead to ineffective treatments and even fatalities, so a physical exam and medical tests have become an important part of medical care. In a physical exam, the doctor examines the patient and checks vital signs (pulse, temperature, blood pressure, and respiration) and asks questions (takes a medical history.) Often the patient will complete a medical history form before the exam, so the doctor will already have the basic information about his or her past experience and family’s health. The doctor may also request various tests, especially if there are problems he or she wants to monitor. Once the doctor has made a diagnosis (decided on the problem the patient has), he usually prescribes one or more treatments to try to help the patient get better. A medication is a medicine prescribed by a doctor (to ‘medicate’ is to treat.) Medicines also include over-the-counter (OTC) drugs, which can be bought at a drugstore or pharmacy without a doctor’s prescription. Many herbs and other home remedies have been used for centuries by families or traditional healers to treat illnesses and injuries. (Tests have shown some to be as effective as current pharmaceutical drugs.) People sometimes also ‘self-medicate’ with whatever they think will make them feel better. There is one more complication. 'Medicine' sometimes means the art that doctors practice rather than a drug. Hippocrates is called "the father of modern medicine." He laid the foundations of good medical practice. A small solid medication taken by mouth (whether it’s a gelatin capsule or a tablet) is called a pill. There are also liquid, topical, and injected medications. Topical means applied externally, to the skin: creams, lotions, and ointments. Injections (often called shots in casual speech) can be subcutaneous (just under the skin) or intramuscular (into the muscle). Intravenous transfusions (IVs) are given directly into the veins, usually over a period of time. The dose or dosage refers to the amount and frequency of the medication. Frequency can vary from every hour to several times a day or p.r.n.—as needed. When doctors prescribe medicines, they consider possible toxicity and side effects: unintended results that are harmful, from minor ones like a dry mouth or upset stomach to very serious complications. surgery (with all team members practicing careful aseptic technique to prevent infection since the surgeon will cut through the skin’s protective barrier) Some minoe surgeries are out-patient (allowing the patient to go home soon after the surgery is over), but most require a hospital stay. Instructions: Choose the best answer or answers for each question, then check your answer. (Some of these will require you to use inferences-- make logical guesses based on combining common knowledge with the information given above.) Click the right arrow to go on to the next question. (with information for health professionals, including links to ways to practice medical communication), Scientific Method Vocabulary or Psychology Vocabulary Quiz. 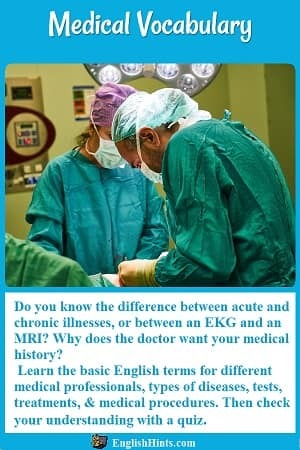 Home> Learn English Vocabulary> Medical Vocabulary.